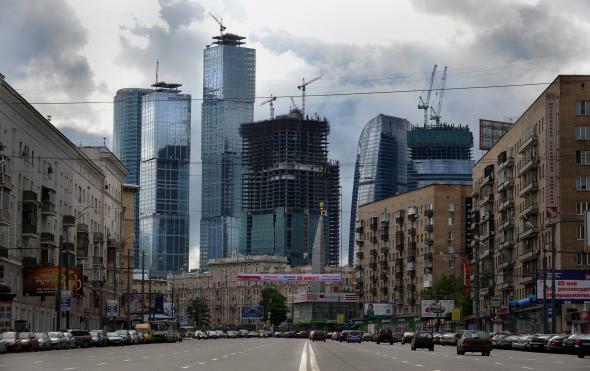 Moscow's $12 billion financial district mirrors Russia's economic crisis. Alas, these glittering edifices are merely Russian window dressing for the country’s worsening economic crisis. Moscow’s financial district is a little like the Russian government’s international stature: on the surface gleaming and new and perhaps even a little intimidating. But scratch just below the surface and it’s mostly empty, with a lot of money wasted. The Moskva City complex contains Europe’s tallest building, Mercury City Tower. London’s Shard comes in second place, but Moskva City also contains the next three tallest. It’s just a shame that most of them are half-empty. There’s a great report in CityMetric on this: The real estate consultancy Blackwood says a dismal 45 percent of the district is vacant, up from a third just a few months ago when the New York Times wrote about it. That’s not the worst of it. Offices are still being built, so the vacancy rate doesn’t seem likely to go down anytime soon. Russia’s economic crisis is hitting its financial centre hard. Banks have been particularly damaged by the crumbling ruble and the sudden slump in oil prices. And that slump is coming at the worst possible time, when there are more buildings being completed than ever. Six are meant to be completed this year, followed by another two in 2016. The government first started planning the district in the early 1990s, when Russian was just emerging from the Soviet system, but the first building was not finished until 2001. Last year the Times report listed the other firms moving in, suggesting that the area was barely even a financial center anymore: 58 percent of new entrants aren’t financial firms. City, the management company for the development in the neighborhood, says financial services companies are no longer the majority of its new tenants. Of the new Russian occupants signing leases this year, 58 percent were nonfinancial companies as well as local small and midsize businesses, like High Level Hostel, according to the management company. New buildings are also being repurposed at the development stage. One low-rise will become a 6,000-seat movie theater. In finished towers, various nonfinancial ventures are renting space. One company sells Cambodian citizenship to Russians wanting a second passport. A culinary school and restaurant are opening.